The white from 1 large hen egg (minus the yolk) contains 16 calories per 33g serving and 4g of protein with no (only trace amounts of) fat or Cholesterol and only 55mg of sodium. This is a much healthier alternative than the whole egg which contains 71 calories per 50g serving, 6g protein, 5g fat (2g saturated), 211mg cholesterol, and 70mg sodium (still, no carbohydrates either way). Egg whites are essentially all protein and provide structure in baked goods. Egg whites also add a frothy, creamy texture to cocktails and help enhance the aroma of other ingredients. They were a popular pre-prohibition addition to drinks, but fell out of favor with the salmonella scare in the 80's and 90's; the odds of catching salmonella from egg whites are fairly slim. Uncooked egg whites are clear with almost no color and gelatinous. Cooked egg whites are bright white, firm and soft. Choosing: If possible pick the freshest laid eggs possible. No cracking will exist in the shell. Buying: Egg whites can be bought frozen or in the dairy section. Egg whites can be used in a number of different ways that are important for many recipes and food items, especially in baking. Egg white can be whipped and added to desserts to add air and give the light fluffy consistancy like in mouses and some cake recipes. 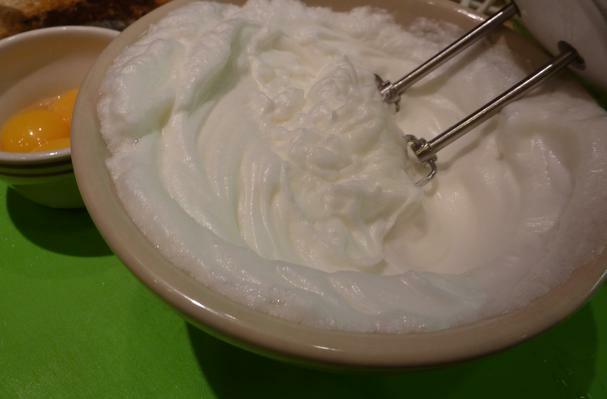 Egg whites ability to be whipped is used in the making of meringues.